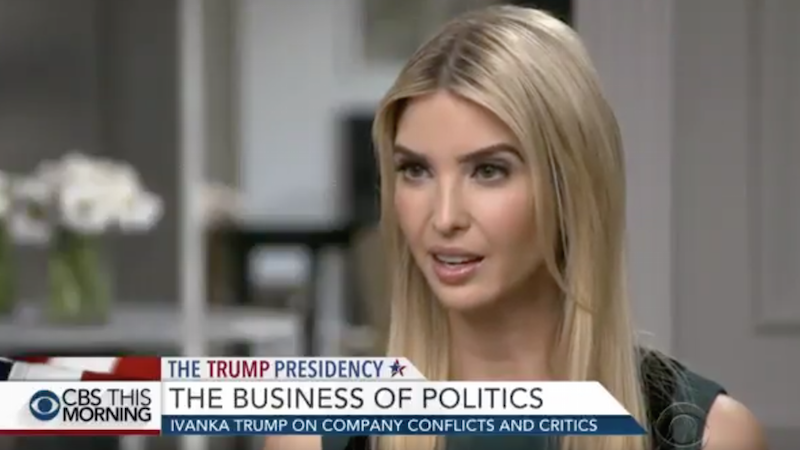 In an interview with CBS This Morning’s Gayle King, Ivanka Trump addressed criticism that she is “complicit” with her father’s administration emphasizing that “lack of public denouncement” is not synonymous with silence. She also addressed the management of the Ivanka Trump brand which she put into a trust managed by two of her siblings, saying repeatedly that she no longer had any involvement with the brand. The interview was standard Ivanka Trump: she spoke sweetly if unconvincingly, staying close to a series of talking points that seemed designed to deflect rather than answer questions surrounding her role in the administration. King asked Trump why she changed her mind about joining her father’s administration when Trump had previously said she would not. Trump responded that she made that statement only a few days after the election and her reassessment “happened very organically.” “I wanted to understand where I could be an asset to the administration. About how I could help my father and, ultimately, the country,” she said. Trump told King that she would “weigh in with my father on the issues I feel strongly about.” Those issues include, according to Trump, “the economic empowerment of women.” King did not ask Trump to expand on what constituted “economic empowerment” nor did she ask her about her father’s health care bill nor his rollback of Obama-era protections that provided necessary protections for women in the workplace. Beyond economic empowerment, Trump did not indicate any issues that she was particularly devoted to but did say that the public should not take her silence as an endorsement of her father’s policies (which ones she endorses and which ones she doesn’t, we’ll never know). She told King that she’s will “lean in” when she agrees with her father. Gayle King: You say that you are your father’s daughter, and we all get that. You also talk about the critics, and you have a couple that say, “Why isn’t Ivanka speaking out? Where is she on Planned Parenthood? Where is she on gay rights? Where is she on the rights of women? Where is she on climate change?” And it’s like you’re being held personally accountable for not speaking up. What do you say to your critics? Ivanka Trump: I would say not to conflate lack of public denouncement with silence. I think there are multiple ways to have your voice heard. In some cases, it’s through protest and it’s through going on the nightly news and talking about or denouncing every issue on which you disagree with. Other times it is quietly and directly and candidly. So where I disagree with my father, he knows it. And I express myself with total candor. Where I agree, I fully lean in and support the agenda and—and hope—that I can be an asset to him and—and make a positive impact. But I respect the fact that he always listens. It’s how he was in business. It’s how he is as president. The interview continued in that vein; a series of half-heartedly vague defenses of nearly every criticism that’s been lobbed at her and, since it’s a morning show, there were virtually no follow-up questions. Trump spoke about her husband Jared Kushner, calling him “incredibly smart” and “very talented.” while attributing her father’s win, in part, to Kushner’s savviness. She did not address criticisms of Kushner’s appointment to the White House, including nepotism and allegations that his appointment was unethical.